Another week, and not much new to report except there’s another new episode of The Cinephiliacs with my friend Kenji Fujishima. We had a great chat and I really loved talking about Fallen Angels, a Wong Kar-Wai film I’ve never really loved, but definitely appreciate more after deconstructing it with him. -Railroaded!, 1947. Directed by Anthony Mann. Streamed via Netflix Instant. -Fallen Angels, 1995. Directed by Wong Kar-Wai. Streamed via Netflix Instant. -Lonesome, 1928. Directed by Paul Fejos. 35mm projection at Film Forum. -Don’t Look Now, 1973. Directed by Nicholas Roeg. 35mm projection at 92Y Tribeca. -Mikey and Nicky, 1975. Directed by Elaine May. 35mm projection at the Museum of Modern Art. -Three Strangers, 1946. Directed by Jean Negulesco. DVD. 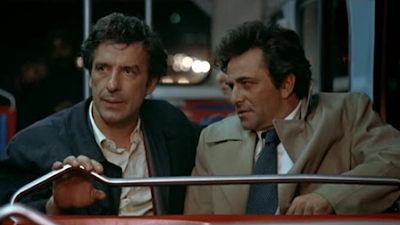 After last week’s discussion about the difference between tight, controlled films and looser films, let me concede to Mr. Brody after sitting through the shock and awe that is Elaine May’s Mikey and Nicky. Reports regarding the film’s making (more footage shot on this than Gone With the Wind) are legendary, but what stands is the film itself: a towering tragedy of the downfall between two friends who first realize how much contempt they have for each other before realizing how much they mean to each other. What makes May’s small time gangster comedy so electrifying is that she forces you to succumb to multiple emotions at once. 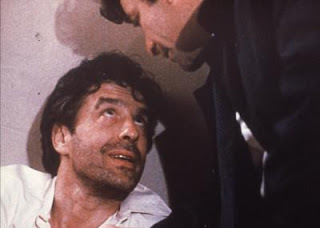 During an early sequence, Mikey (Peter Falk) attempts to force feed Nicky (John Casavetes) a pill that’ll calm him down. May plays up the comedic aspects of toward the physical ridiculousness of it all, but it’s also harrowing, and causes the body to tense as if violence could explode at any moment. This spontaneity, which I stood ambivalent about last week, kept me enraptured for the film’s running time. Here’s a story that’s bared down to its elements. We know very little about why Nicky is on the run and has a hit on him, or what exactly the two do in the first place. Instead it’s a story about male friendship and the bonds that’ll break them (and of course it takes a woman to have such a perceptive eye about male friendships). The energy of the film is manic – shot through the dark streets of Philadelphia with a grainy texture. May’s compositions reflect this ambivalence of our feelings. In a late scene, Nicky makes love to a woman while Mikey is in the next room (there’s no door). May spaces the two and contrasts between the strange energy of the left side of the frame with the awkward calmness of the right side. It’s somewhat horrifying, but it’s also uncontrollably funny. Perhaps that is why May’s small film immediately strikes me as one of the best films I’ve ever seen (the masterpiece word I try and use sparingly). Most films infect you with thoughts and intellect – Mikey and Nicky does that too, but it also made me uncontrollable in terms of how I felt. The film constantly switches your identification with the two friends (it’s no surprise that their names are so similar) as you realize how they’ve screwed each other over. But a friend is still a friend, so as the film ends on Mikey’s eyes, and the soulful look of Falk is a pierce through the heart. The actor gives it his all, and those eyes say it all. As the sunlight comes up, the true ugliness of these men, which was hidden in darkness before, is finally revealed.